Suntuitive Dynamic Glass is the world’s leading innovator in self-tinting dynamic glass. Suntuitive is also used by more certified fabricators than any other dynamic glass in the world! A large network of certified fabricators around the world means that your glass can be fabricated locally, which is more cost-effective and sustainable. We offer the largest variety of design options when it comes to dynamic glass, so designers and architects can create a truly custom dynamic window that will fit the needs of any project. More tinting doesn’t mean less daylight. Our thermochromic technology allows in optimal daylight, even when the window is fully tinted. This means retaining daylight autonomy and better natural light for building occupants. Our self-tinting glass is easy to install, doesn’t require wires, sensors, or controls, and starts working right away. Experience optimal thermal and visual comfort behind Suntuitive Dynamic Glass without having to operate windows manually or deal with software. Suntuitive knows what to do. 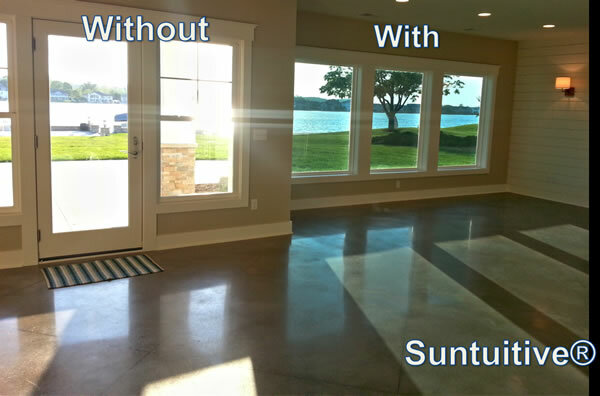 Suntuitive Dynamic Glass is a passive technology. It doesn’t require any external power source or input other than direct sunlight. Suntuitive can help your project earn credits for WELL, LEED, or BREEAM certification, and fits well within the Green Building space. Add value to your building and see a return from your occupants. Not only does Suntuitive Dynamic Glass add tangible value to your building, it introduces cost savings and helps employees be more productive, students be more engaged, and patients to heal faster. Suntuitive Dynamic Glass is based on thermochromic principles, so the installation and function of the glass couldn’t be more simple. Suntuitive Dynamic Glass is based on thermochromic technology. Our thermochromic elements, the dynamic heart of our glass, activate by the heat from direct sunlight causing the window to tint as necessary. These elements are embedded in a PVB (polyvinyl butyl) interlayer, which is then laminated between two pieces of glass. This laminate is then incorporated into the final product, a dynamic insulated glass unit (IGU). Windows with Suntuitive Dynamic Glass install the same as any other window or IGU, and can even be installed in operable windows and doors. Installation is simple and doesn͛t require any additional trades at either the design or installation phase.